Yann Moix is a well-known French writer and regular guest on the talk show watched by millions, “On n’est pas couche” (which means: “We’re not ready for bed, we’ve still got lots to do”). 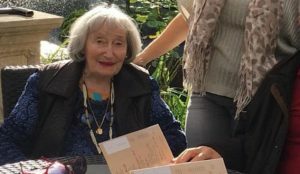 The other day, in an emotional state, he read out part of a poem he had just written about Mireille Knoll, the 85-year-old Jewish woman who was stabbed to death, and then set alight in her apartment, by one Muslim attacker, while another Muslim apparently watched. The actual killer had been the neighbor of Mireille Knoll, whom he had known, and who had befriended him, for 20 years. Yann Moix does not hold back on the subject of Islamic antisemitism. He writes of “Muslim Nazis.” He makes clear the link between the Nazi murders of Jews and those by Muslims today. It’s the first time on a national television program, in France, where such things have been spoken about in so outspoken a fashion. Here is the poem, in English and then in the original French. Liberties have been taken with the literal translation only where necessary to better preserve the sense. Hidden in the madness of Muslim Nazis. Was to have in their blood a God who was not there. But the same steady hate, and only the executioners had changed. Now endorsed by a different hand. Will forever bear the name of desecration.